I am linking up with Ladybug's Teacher Files for a Classroom Shopping Linky Party. This is my first time partying with all you teacher bloggers out there and I am so excited! I have been collecting things over the past week, so I am a bit late to be linking up. I had to wait until our fiscal year started so I could get reimbursed for my purchases (up to $275). I am glad we are actually getting our supply money this year. First off, I would like to say, that I like to shop on the cheap. I just don't think there is any other way. I have been building my classroom library for a few years now, and I have found that a great place to do that is a thrift store (Goodwill, Salvation Army, Miracle Hill, etc.). I ventured into the thrifting world last summer break when I started decorating my house. I started a blog about that too! Head over to Creative Carolina Charm to check it out if you love a good thrifty transformation. Anyway, off topic...focus, focus! So, I love rambling through the bookshelves at my local thrift stores to find books for my kiddos. I might look a tad bit like a crazy lady sitting on the floor going through all the books, but hey, it's all about a good find. After thrifting it up, I headed over to Target! I try to visit my local store at least once a week during the summer to raid the dollar bins. I don't play around with the raiding! I may have accidentally scared a lady beside me today when I yelled, "YES", because I found a grade book for a dollar. Oops! She probably thought I was a little crazy, but I know all you teachers understand. 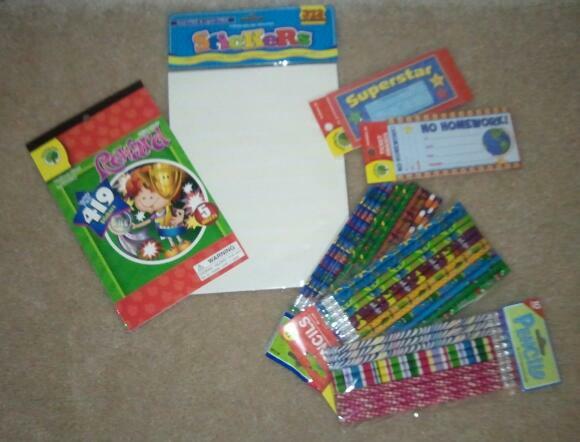 I was especially excited about the pocket charts and the four packs of sentence strip white boards. I heart you Target! Then, I headed to Dollar Tree to scope out the place. I was a bit disappointed because they didn't have as much good teacher stuff as they usually do. I will keep checking in the coming weeks. Now, I just need to get it all to school and get to work! Link up and share what you have found so far. I'm a third grade teacher as well and I'm so glad I found your blog! I now follow!